The day before yesterday, alleged child molester Roy Moore was beaten in a race for an Alabaman Senate Seat by Doug Jones, an attorney who prosecuted Klu Klux Klan members who had roles in the 16th Street Baptist Church bombing. The race ended up being quite close, with Jones winning with 49.9%, only 21,311 votes more than Moore. While this should have been a simple vote, for Alabama it wasn’t. At least not if you’re white. Moore pulled in 68% of white voters, while Jones pulled in 96% of all Black voters. The following day, dozens of articles came out, rightfully lauding Black women for consistently opposing Moore. 98% of Black women opted not to support a child molester. Several Black women wrote articles in response to the barrage of thanks, notably Brittany Packnett’s brilliant piece titled “Black Women Kept Roy Moore Out of Office. Here’s How to Actually Thank Them”. Additionally, there is a Google Doc detailing every Black woman candidate running for office, with links to support their campaigns, that way you can do more than thank them and elect them. The DNC’s chair Tom Perez called Black women “the backbone of the Democratic Party” the next morning. And that’s true. But why must we rely on Black women to carry our weight? Why would this even need to be said if it wasn’t already being taken for granted? And besides all that, why isn’t it the responsibilities of everyone who has a backbone to use it to their best ability? What about the white men who voted 72% in favour of Moore? Where’s their accountability? I’d love to see articles asking why a party claiming “family values” has been failed by irresponsible white men. At the time of this writing, I’m not seeing any. 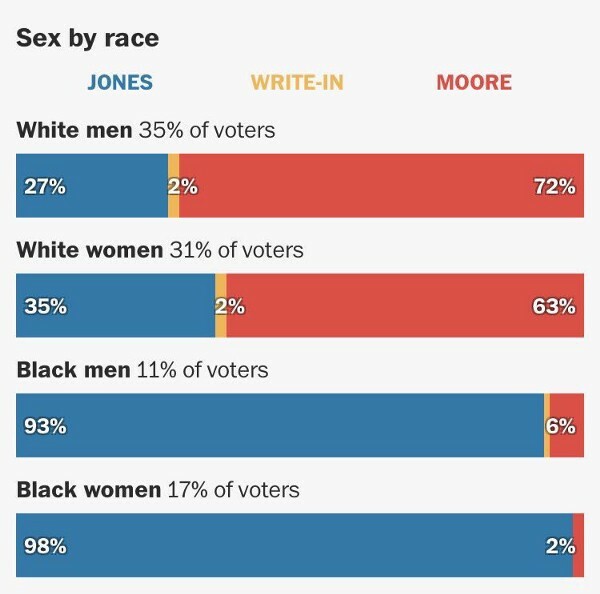 What about the white women who made up 63% of Moore’s voters? Where is the analysis examining what would cause women to vote for a man who preys upon and abuses women? Data scientist Samuel Sinyangwe. You should follow him. When do we get off the self-congratulatory train of casting ourselves as people who supported Black women all along and ask; how the hell did we allow it to get to this point? 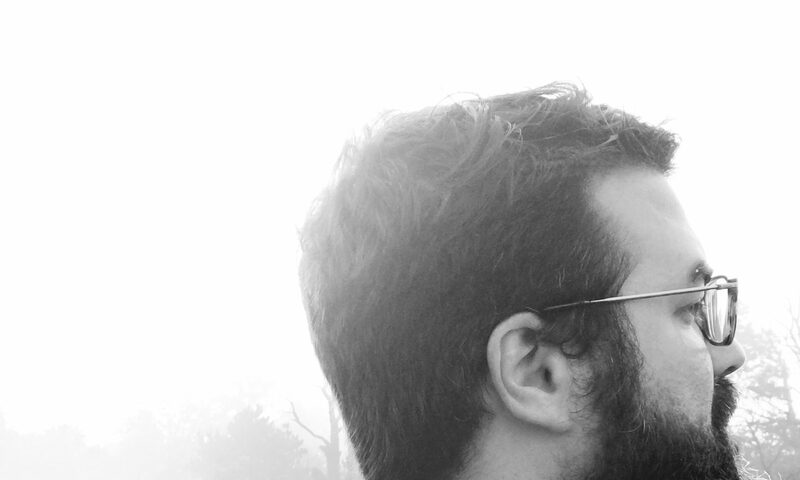 Until white people start making sure men don’t get into office who harbor neo-confederates, glorify slavery, call preschools “Nazi-like institutions”, and claim Illinois is under Sharia law, we need to shut the hell up. When are we saying, how the hell do we allow this? We are obsessed with pain. As much as I want to believe the promises written in the Psalm are true, I also know that those who cry as they carry the seeds don’t often return with bundles of grain. Because the bundles are stolen from them, and they’re sent back to fields to sow some more. 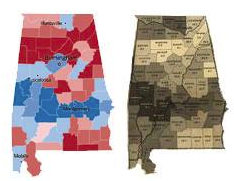 The voting map of Alabama compared to a map Lincoln used to determine each county’s reliance on slavery. Yes, I know the whole faith was pretty much founded on sacrifice and martyrdom. We’re supposed to be like Jesus, and Jesus hung himself on a cross. But if that’s what we boil the faith down to, it turns into a masochistic machine of torment, where we demand pain and suffering from those we lionize. Nobody is safe from it either. Our current president has quite literally grown up with a silver spoon in his mouth, and yet he has been forced to diminish over and over the mountains of wealth he inherited from his father. 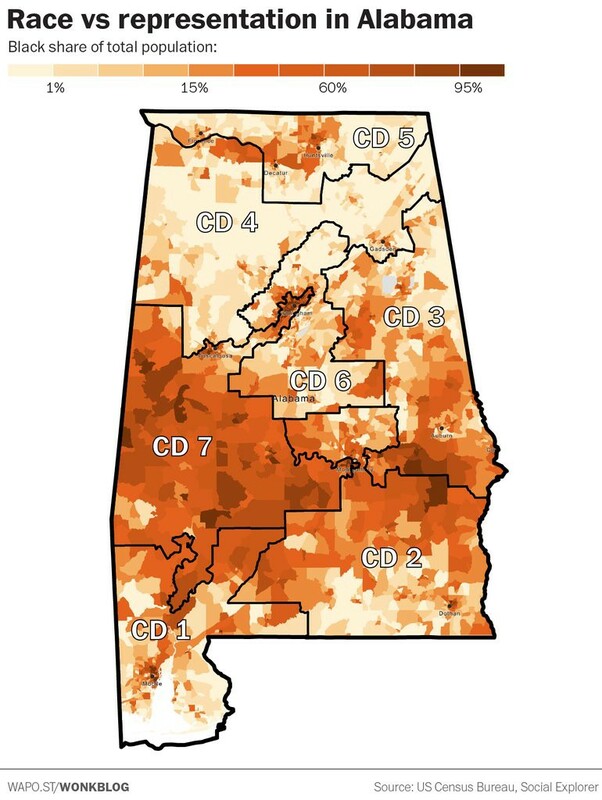 Alabama’s congressional districts. Jones won the popular vote by 1.5% but lost 6 out of 7 districts. This is what voter disenfranchisement looks like. The problem with this appetite for pain is that those who are on the margins (who have so much more at stake) usually get the brunt of the demand for suffering. They’re the ones who are told they must vote to save Alabama. Bree Newsome, who ripped down the Confederate Flag. You should follow her too. We’re not all doing the work. White people are reaping where we do not sow. The tears from the Psalm won’t be joyful until we are ALL doing the work and making sure ALL are bringing back bundles of grain. 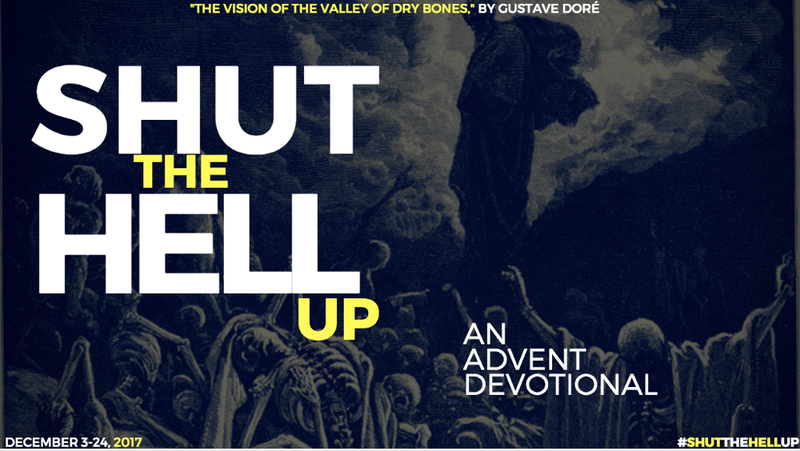 If you liked this devotional, you should check out the rest in this series by a variety of talented artists and writers. You can find them all here. Subscribe to them, support them, listen to them.